A tank experiment showing ship-generated internal waves. When entering a fjord from the open ocean by ship, it can sometimes be noted that the speed of the ship changes even though apparently nothing else changed – the wind didn’t change, the position of the sails didn’t change, the settings on the engine didn’t change – whatever was driving the ship didn’t change. And yet, the ship slowed down. How can that be? Yes – the ship excites internal waves at a density interface. 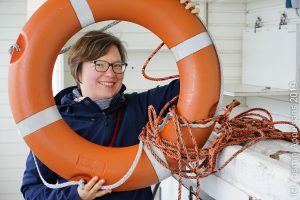 Since the stratification in a fjord is much stronger than in the ocean, driving into a fjord means loosing a lot more energy towards the generation of internal waves. This entry was posted in demonstration (difficult), tank experiment and tagged density, GEOF130, internal waves, ship-generated waves, stratification, waves on November 20, 2013 by mglessmer. Details of lee waves in the tank. A movie focusing on details of the lee waves in the tank. In this movie, the concept of hydraulic control becomes visible. On the upstream side of the mountain, the dense water layer forms a reservoir which is slightly higher than the mountain. On top of the mountain and towards its lee side, the layer of denser water is stretched thin and has a smooth surface until about half way down the mountain, where waves start to form. In this thin, smooth layer, flow speeds are higher than the wave speeds, hence disturbances of the interface are flushed downstream and cannot deform the interface. Only about halfway down the mountain, the phase speed becomes equal to the flow speed, hence waves can both form and stay locked in place relative to the mountain. This entry was posted in demonstration (difficult), tank experiment and tagged density, GEOF130, internal waves, lee waves, oceanography, tank experiment, teaching, waves on September 21, 2013 by mglessmer. How internal waves in the ocean can be spotted on the surface. Under certain conditions, internal waves in the ocean can be spotted at the ocean’s surface due to changes in surface roughness or to the movement of floating foam or debris. They can be spotted if half their wavelength is longer than the distance between the interface on which the internal wave is traveling and the water surface, so that the orbital movement caused by the internal waves reaches the water surface. In the tank, they can also be seen – for example by adding small floating particles to the water surface. Internal wave in a tank. Seen from the side due to different coloring of the two layers, and on the surface in the distribution of floating tracer. In the movie below, you can see the interface between water layers of different densities and the water surface with particles on it. The particles make it easy to spot how the water surface is being stretched and squeezed as internal waves travel through underneath. This entry was posted in demonstration (difficult), tank experiment and tagged density, GEOF130, internal waves, lee waves, oceanography, tank experiment, teaching, waves on September 20, 2013 by mglessmer. 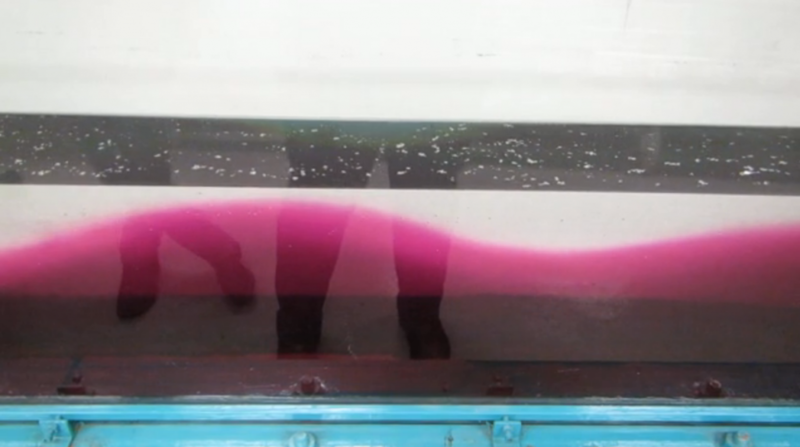 Internal (lee) waves in a tank. 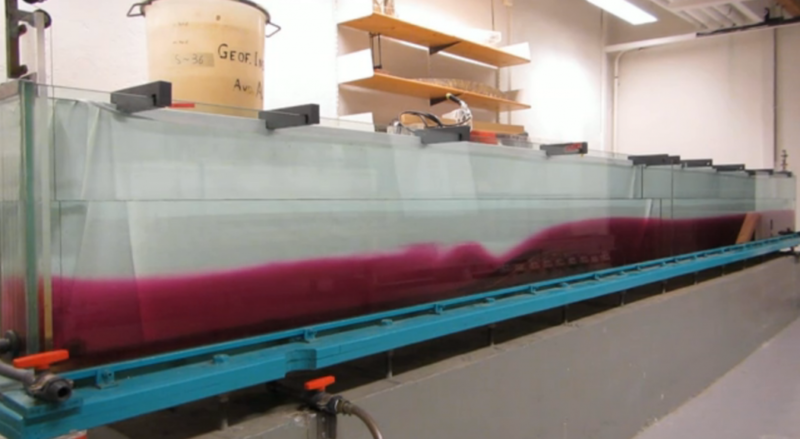 Lee wave experiment in a large tank with a moving mountain. In this previous post, we talked about internal waves in a very simple experiment. But Geophysical Institute has a great tank to do lee wave experiments with that I want to present here (although it doesn’t seem to be clear what will happen to the tank when the remodeling of the main building starts in November – I hope we’ll be able to save the tank!). I think it has originally been used for real research, but these days the GEOF130 lab is the only time this tank gets used. Tank for internal lee wave experiments – a “mountain” is moved through the tank and generates internal waves. In this tank, a “mountain” can be moved all the length of the tank through more or less stagnant water, thereby simulating a current going over a non-moving mountain (which might be a slightly more realistic setup). 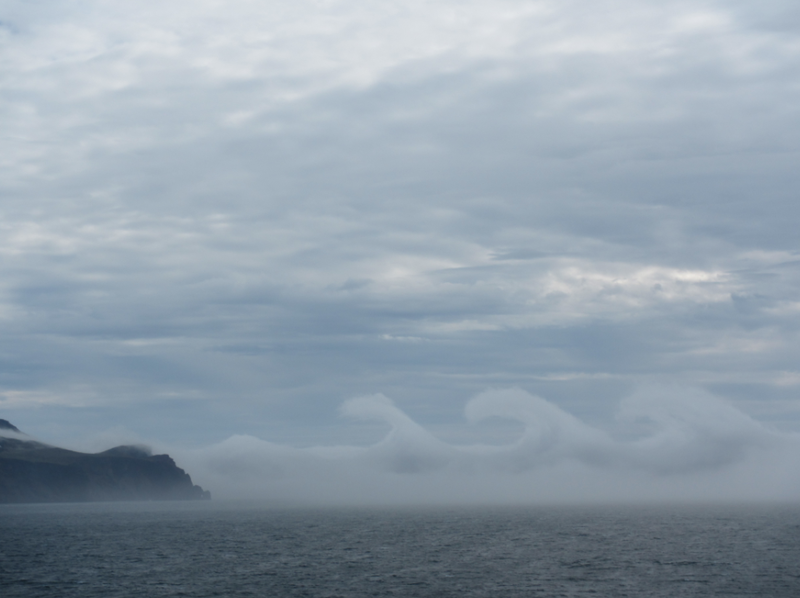 At the lee of the mountain, lee waves form on the interface between two water layers of different density. This entry was posted in demonstration (difficult), tank experiment and tagged density, GEOF130, internal waves, lee waves, oceanography, tank experiment, teaching, waves on September 19, 2013 by mglessmer.